Wait, I literally can! Do you guys know how cold it is here? COLD. But I promise, I am not talking about the weather today. 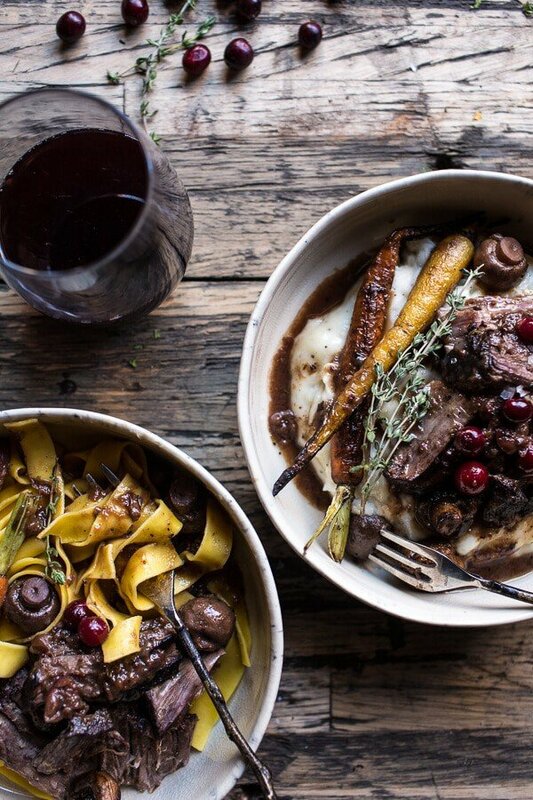 Cause um, we have a cranberry pot roast to talk about!! Sounds so good, right? Like what meat-eater is not a fan of pot roast? My mom always made pot roast on Sunday or Monday nights throughout the fall. Pot roast was another one of “her” meals and probably one of her favorites to eat too. Mom’s pot roast recipe was very retro. Think add a can of this, another can of that, some broth, some beef and throw it in the oven. Key word here: can. I’m not majorly opposed to canned food (sometimes convenience rules), but typically I try to omit the cans of soup with a mega list of ingredients and low nutritional value whenever possible, because… I will not lie, they creep me out just a bit. Cranberry Pot Roast from Half Baked Harvest on Vimeo. But don’t get me wrong, there is a time and place for them. Hello cheesy potatoes…you just are not the same without that can of cream of chicken. <–Truth. Anyway, my pot roast recipe is clearly a little different from mom’s. For one, no canned goods. Two, and most importantly, the cranberries! Guys, don’t be freaked. I promise, this combo isn’t weird, just good. Really good! Beef and cranberries are like two peas and a pod. They just work together, especially when slowly cooked all day. The cranberries add SO much flavor, but they are not overpowering in any way. It’s kind of hard to describe, but I just know you guys will love it. I also added a bit of balsamic to really play up the cranberries and honey and balance them out. Think of it like cranberry sauce, but with red wine, thyme and then served with beef as opposed to turkey. The pot roast is just slightly sweet, but mostly savory. You see, cranberries can be used for things other than the once of year batch of cranberry sauce!! I was actually just saying that cranberries are good with so many things, it’s kind of a bummer their season is so short! Oh well, it just makes me all the more excited for them when this time of year rolls around again! 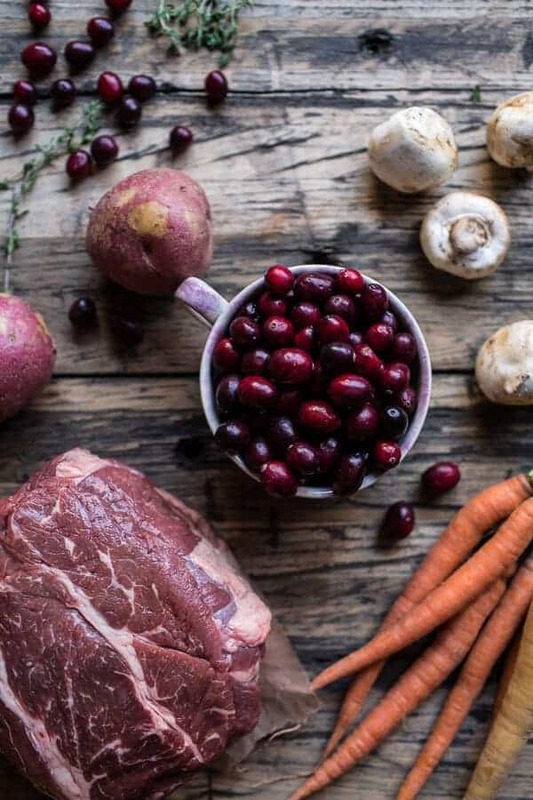 Of course, there are also all the other typical pot roast ingredients: the chuck roast, onions, carrots, thyme, a little red wine, some mushrooms, potatoes… the works. SIDE NOTE: As a kid I never had any interest in the beef. I did love pot roast, but I swear, it was solely because of the carrots. Mom would always add extra carrots just for me, because I honestly only ate the carrots. I love how they get all caramelized and delicious in the sauce. I know, weird, but carrots in pot roast are my favorite! Okay, so you may have noticed that I served this pot roast with not only mashed potatoes, but with egg noodles as well. I just could not decide which way to go and neither could the fam. I put a call out on our Group Me message board to the cuz’s and the sibs, but got equal amounts of masher lovers to noodles lovers. The decision… the struggle was REAL! So I just gave in and went with both. I personally think mashers go best with pot roast, but my mom strongly disagrees. She is a noodle girl all the way. To each their own I guess! And now I must mention how easy this meal is. I know that pot roast is generally an easy meal, but I myself haven’t made that many, so I’m always kind of in awe when I do. Just use one-pot, sear the veggies, sear the meat and then add in all the remaining ingredients and slow cook away. Depending on the size roast you have it should take around 3-4 hours. Once the meat is tender and falling apart, it’s done! You don’t even need to cut the meat, it just pulls right apart making serving this right out of the pot easy-peasy. Which is nice cause that means less dishes to wash. YES! And finally, I have to say that this is the PERFECT easy meal to get you through the busy month of November. I know that November is all about Turkey Day, but we still have to eat during the 25 days leading up to Thanksgiving. This is your meal for one of those busy days! Feed it to your family, feed it to your holiday guests and then devour the leftovers for lunch….YUM. Serious question for the day: Are you a buttered noodles or a mashers person when it comes to what to pair with your pot roast?! Guys, don't be freaked. I promise, this combo isn't weird, just good. Really good! Season the chuck roast liberally with salt + pepper all over. Heat a large dutch oven, over high heat. Add one tablespoon of olive oil. Add the onion, carrots and potatoes (if using) and cook, stirring once or twice until the veggies are just slightly browned on the edges, about 5 minutes. Do not leave the veggies in there too long, you don't want them to become soft. Remove the veggies to a plate. Add another drizzle of oil and once hot, add the chuck roast and sear all over, about 3-4 minutes per side. Remove the chuck roast from the pan. Carefully pour in the wine and deglaze the pan, scraping up any brown bits off the bottom. Remove from the heat. Add the meat back to the pan and cover with 2-3 cups of beef broth, the worcestershire sauce and the balsamic. Throw in the mushrooms + browned veggies, thyme, rosemary, cranberries + honey. If the liquid is not covering the meat at least half way, add more until it is. Cover the pan and place in the oven. Roast for 3-4 hours or until the roast is cooked to your liking. Serve over mashed potatoes or eggs noodles. i used to do that with the carrots (and the mushrooms), too! or at least i wanted to, even if my mom snuck a couple pieces of meat in underneath the veggie mountain. but i’m also into the beef now, especially when it’s as meltingly tender as i bet this one is! I love that you added the cranberries, it’s just perfect, and I was always the carrot eater in the family too so I’m lovin those! Wow, I see the dilemma with taters vs noodles cause I don’t even know how I would pick. This roast looks awesome and that + how super easy it is makes it something I have to try! Haha, I think I agree there. But I’m with you Tieghan on the “can” stuff. It creeps me out just because of the chemicals. Bleh. The aluminum you supposedly consume when you eat canned food. For us, Sundays + Pot Roast = True love always!!! Thank Tom! Hope you are having a great week! Thanks Lynne! Have a great week! My mom always puts carrots and potatoes in with her pot roast, so I guess I am going to side with mashed potatoes! The carrots are my favorite part too! I am really excited to try this version as cranberries are my FAVORITE thing about Thanksgiving season lol (or anytime! They are amazing!) thanks for another delicious recipe Tieghan! Sunday was my mother’s pot roast day and I liked the meat and noodles but my mother left me raw vegetables because I didn’t like the pot roast ones. I love pot roast and my favorite part are the carrots and parsnips. That gravy over potatoes or polenta is the best. Can’t wait to try this recipe. Mashers, all the way!!! Potatoes are my thing, my weakness, my sin, I could eat potatoes any old way at any meal with just about anything – except for chips, I am not a huge fan of chips, nor fries. I also dislike beef, I don’t eat beef except in my ground meat, where I like to add a little beef to my pork, but aside from that it is a kind of meat that I really cannot stomach the flavour of. But as I read on, I was already pairing the ingredients in my mind with… venison!! Do you think it would work? I’m crazy about venison, and have always thought it might pair really well with cranberries, although where in the world am I gonna find fresh cranberries here in Portugal is a mistery to me… still, the dried ones might work, heh?? I think venison would be delicious in place of the beef. I love the idea!! Thank you so much, Miranda!! 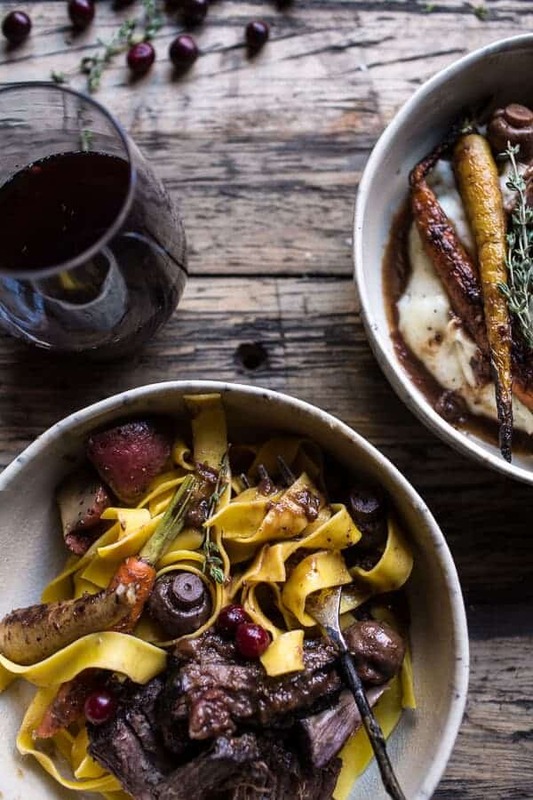 I have to say, I’m not usually not a “pot roast person” but I have never wanted to dive my whole head into a bowl of roasty- deliciousness until now! Those cranberries are perfect! Haha! Thanks so much, Taylor! Hope you had a great day! Tieghan! I definitely have to put this on my must make list. For me, the flavors remind me a little of your short rib sliders which were INSANELY delicious! THANK YOU! Hope you are having a great week, Ramona! pot roast was my mom’s go-to meal when we were growing up, too. Love those cranberries, looks amazing as always! Thanks Allyson! Hope you are having a great week! Oh my word this looks delicious! I’m a smashed potatoes kind of gal when it comes to pot roast! 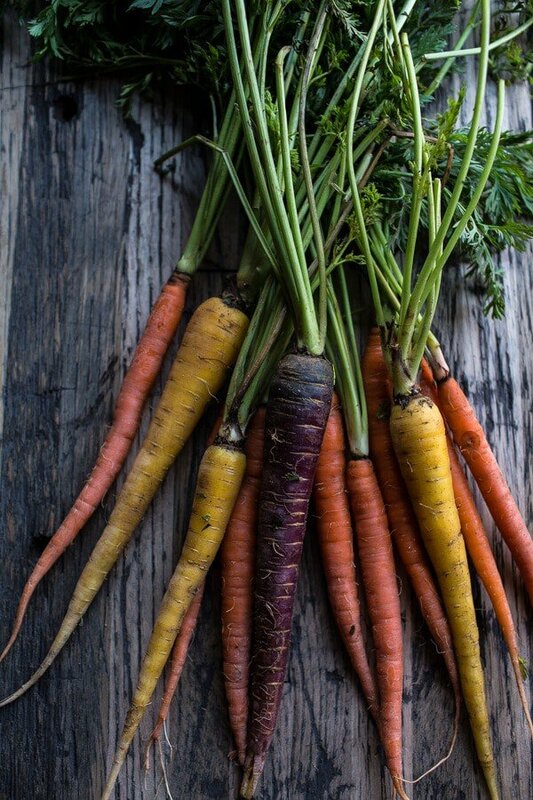 Why are rainbow carrots the most photogenic thing ever? This looks great Tieghan! Love the cranberry addition. I Know! Love photographing them! Thanks Laura! Umm… Tieghan, this looks BEYOND incredible! And I’m right there with you on the carrots. It’s the only way I’ll eat them except raw dipped in ranch. I am dying to make this now, and when I do, it will be with mashed potatoes! I have never eaten a roast with noodles. Yes, a slow cooker will work amazingly well! Just sear the meat + veggies and add to the crockpot. Low and slow is best! Hope you love this and let me know if you have other questions. Thanks! I made this in a slow cooker, and FYI–it does take longer than doing it in a dutch oven. Plan on more like 8 hours instead of 3-4. Thanks for the tip! Hope you loved the roast! 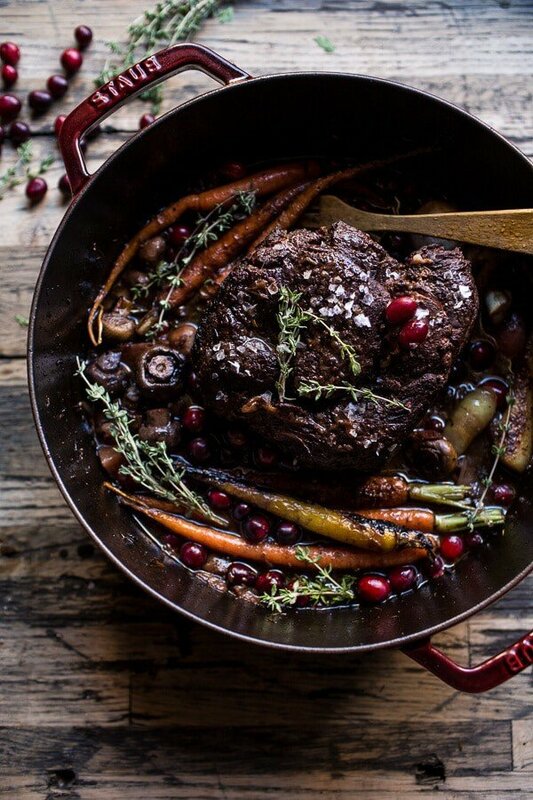 This is probably the most beautiful and delicious looking pot roast I have ever seen! Love the cranberries in this!! Awe! Thank you so much, Erin! Hope you are having a great week! I’m in the mashed potato camp. It soaks up the juices from the pot roast and is so so good. This looks amazing! 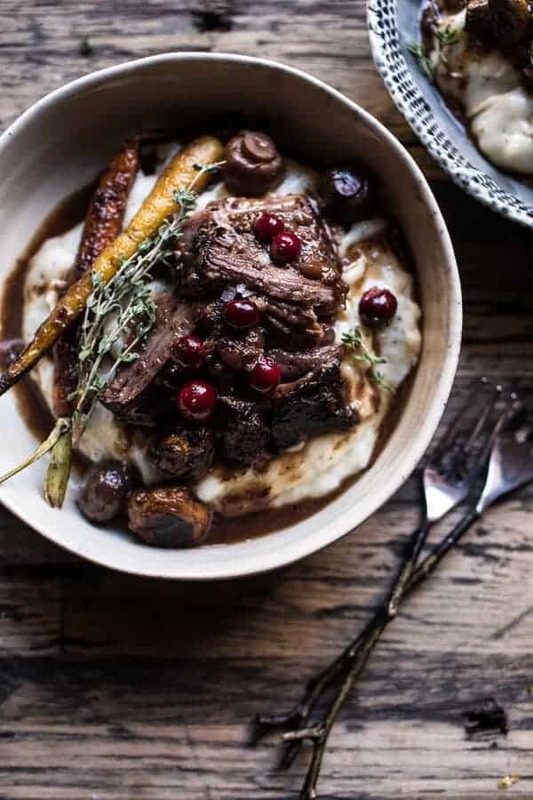 I never thought of cranberries with pot roast but I bet it really puts the flavor on a whole other plane, somewhat tangy and fruity. I’m going to have to try this soon! Do you think you could put it all in a crock pot for the last phase of cooking? I would love to come home to it being all ready to go after running errands but don’t want to leave the oven on while I’m gone. I think adding this to a crockpot after searing with be GREAT!! Low and slow all the way! 🙂 Hope you love the pot roast and let me know if you have any questions. THANKS! This looks delicious! The mashed potatoes are always a must with a roast! Mash or noodles? I love both! With this pot roast? I’d be hard pressed to say since both would be great! 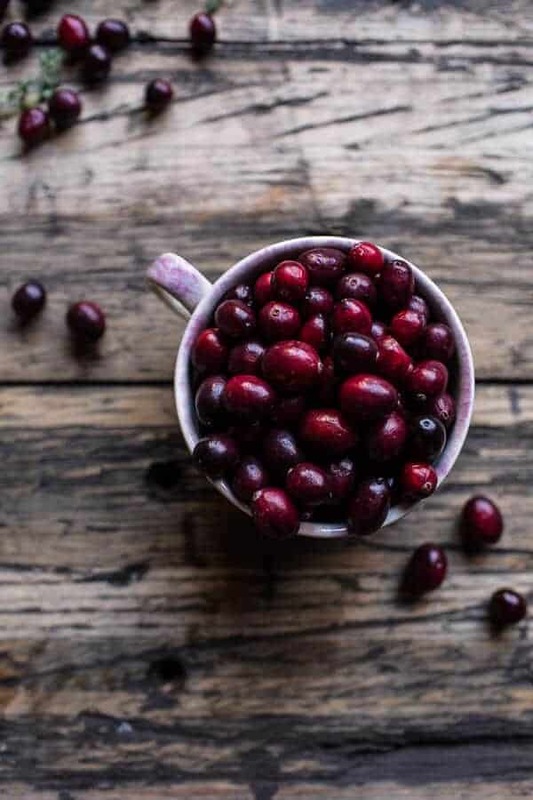 Cranberries are a bonus – I always scarfed down the mushrooms, and carrots as well. 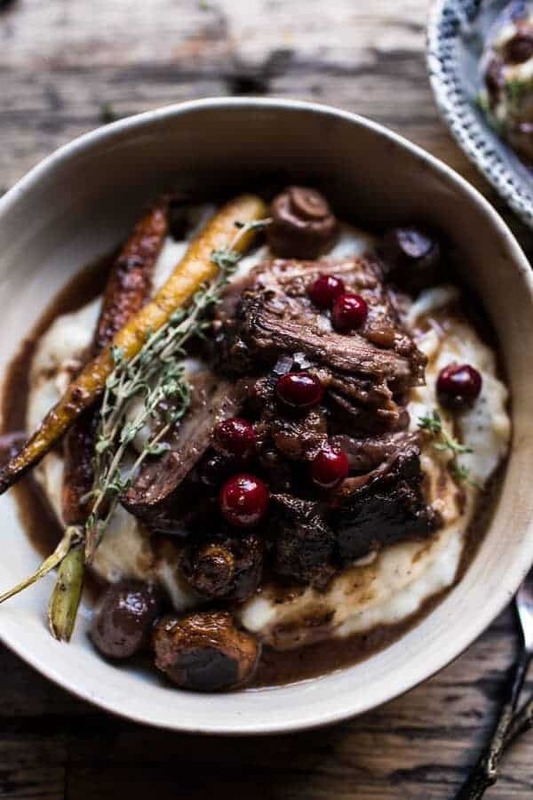 Very similar to my pot roast…but the addition of cranberries sounds divine. Will try next time I make roast. By the way…potatoes! Thanks Dina! Hope you love the pot roast! I can literally TASTE the holidays through this photo, absolutely stunning!!!! would love this over a fat bowl of creamy, parmesan polenta, this looks beyond girrrl. YEAH! That was kind of the idea in the back of my head! Thanks Christine! I’m not freaked. 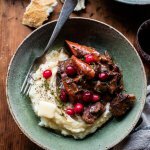 I love cranberries in everything and this pot roast is no exception. So good! This looks so warm and comforting. And that shot of all the colorful carrots! I’m obsessed with it! I would have to say, mashed potatoes all the way to go with this. Something about the sauciness just creams for some creamy potatoes. Hehe! Thank you so much, Chelsea! I hope you are having a great week! Awesome! Going to try this this weekend. Do you think it would be OK in the crockpot instead of a dutch oven?? HI!! Yes, I think a crockpot will be GREAT! Low and slow is the name of the game! 🙂 Let me know if you have any questions and I hope you love the pot roast! 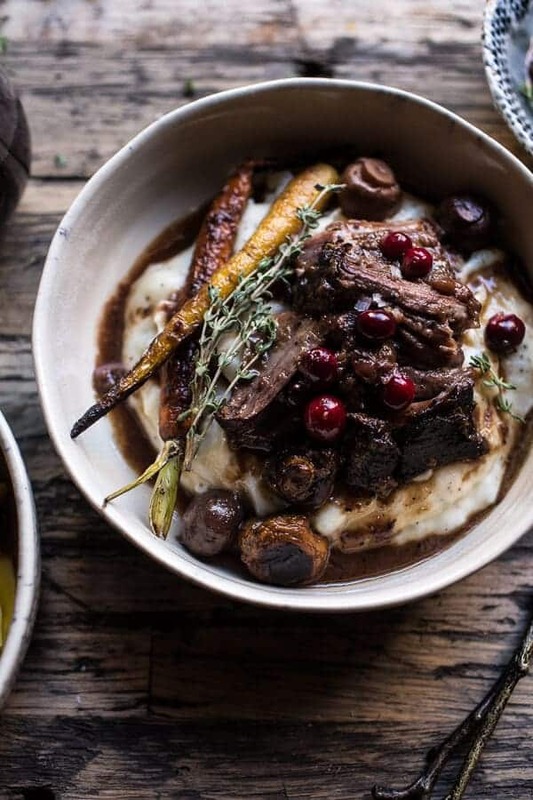 This Pot Roast looks gorgeous! Gotta say I would be a mash potato girl the first day, then the next day those leftovers would be served on noodles and eaten while watching Gilmore Girls re-runs. Just saying’. Hi! I would like to know if your chuck roast is unboned? Thanks! Yes, my chuck roast did not have a bone, that said I think having the bone in does add more flavor if you have the option. Hope you love this and let me know if you have any other questions. Thanks, Tieghan! 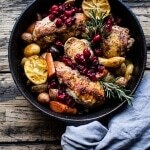 this reminds me of a nice fall dinner, using cranberry is so yummy a different flavour we don’t use everyday! 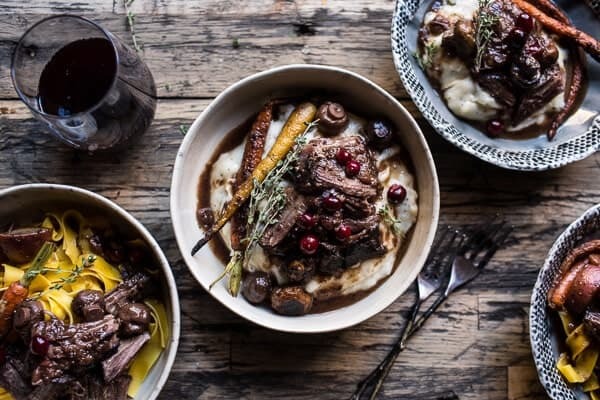 Pot roast has never looked better, what a cozy fall dinner! This is exactly what I’ve been looking for during the holidays. It looks great, I can’t wait to try it! Thank you. Could you cook this in the crockpot after searing the meat? Yes, that will work great! Hope you love this recipe! Thanks! This look SOOOO delicious! 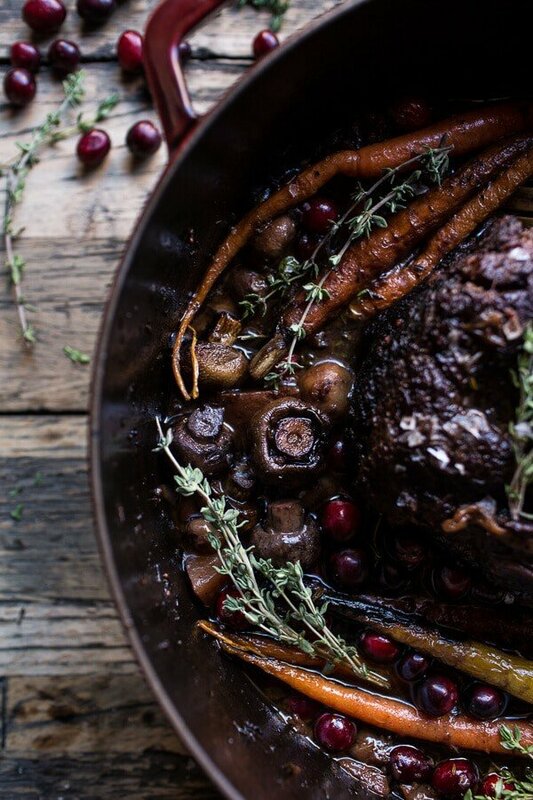 I tried my first cranberry pot roast last year, and it was the best thing ever. Definitely plan to try it out again this year! Awesome recipe! I feel your pain about the cold weather. It’s freezing right now in Minnesota–it just started snowing last night! 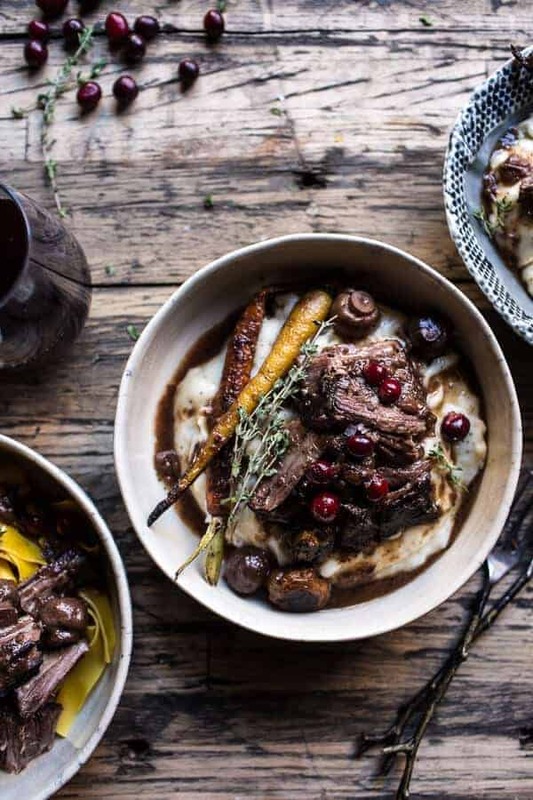 This pot roast looks so delicious and perfect for cold weather! Mash potatoes for sure! It makes everything better, so I’m betting it makes this pot roast even more insane! Mashed potatoes ALL THE WAY. We also make extra gravy with some of the juice to pour over our dish as we please and then use freshly baked rolls to soak it all up. DUH BEST. Oh and the carrots are my favorite too! 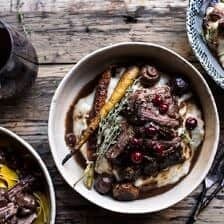 So, last night we made this scrumptious Cranberry Pot Roast recipe… (I believe from reading the above comments that I’m the first to post the recipe results)… FABULOUS! The entire family raved and it looked and smelled so delightful. I even posted photos on FB and Instagram and was asked for the recipe link! I love roasting my meals, and look forward to creating more of your fabulous recipes! This sounds so delicious! Thanks for posting the recipe! My oven is broken, so I’d have to prepare it on the stove-top. I’m wondering if it will turn out as good? I’m guessing I’d just simmer it slowly and keep an eye on it so that it doesn’t dry out. Hi! Yup, that is what I would do. I think that should be fine, just be sure to make sure nothing is sticking to the bottom throughout cooking. Hope you love this, thanks!! Oh awesome! I am thrilled the recipe was a hit! THANK YOU! Looks fantastic, but wondering if the veggies should be added later? Seems as if they would get mushy if cooked entire time with meat. Anyone? Thanks. Hey Sally! The veggies are soft, not mushy, but if you prefer them firmer, just simply add them closer to the end of cooking. Hope that helps and I hope you love the recipe! I’m intrigued by the temperature that you set your oven at. I made a pot roast in a Le Creuset dutch oven the other night .. following a crock pot recipe .. and wasn’t sure what temp to set the oven at. Went for 325. I’m going to try THIS recipe .. because it looks AMAZING, but also to see if the meat will be more tender. Thank you to all who have actually tried it already.. sounds like it turned out great .. Will be making it this weekend! Hope you love this! Let me know if you have any questions. Thanks! I can’t wait to try this recipe! Would I be able to use frozen pearl onions in place of the quartered onion? The whole family was a fan of them in a previous pot roast. Thanks! OMG, I need this meal in my life RIGHT NOW. Haha! Thank you so much, Rachel! Hope you have a great weekend! This looks absolutely delicious can’t wait to try it! Thank you for the recipe. However I don’t have a slow cooker – do you think this could be prepared in a slow cooker? Thanks!! Do you know if I could make this in a pressure cooker? Should I change anything other than the cooking time? Hi May, I do not own a pressure cooker nor have I used one, so i really cannot help. I do think it would work, but as far as cooking times go, I just do not know. Very sorry I was not of more help! Great recipe! Can I make this in a crock pot? You can, just cook on low for 7-8 hour or high for 5-6. Hope you love the pot roast! Hi Neli! If you like the veggies a little firmer, I would add them around the 4 hour mark. I think that should still give them enough time to cook, but not be overly soft. If towards the end of cooking they still feel a little firm, just crank the heat to high for the remainder of the time. Let me know if you have questions! AND that is so awesome he chose my recipe! YEAH! ? Hello! 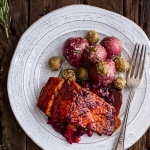 I am planning to make this on Friday and bought 2 chuck steaks that add up to 5 pounds since I couldn’t find a roast, is there anything that I should do to modify the recipe? Hi…I just have to say that I made this and was fairly disappointed in how it ended up looking. Flavor wise it was good, but my rainbow carrots lost all of their cool colors after cooking in liquid for 4 hours. Also, my cranberries turned translucent. If I make this again, the carrots will cook separately and the cranberries will go in closet to the end of the cooking time. I was hoping for a visual closer to what your pictures show since I was making this for a special dinner. Not sure how you kept the color of your carrots and cranberries so intact. I made this for Thanksgiving instead of turkey and while the meat came out great, just like Kari the veggies came out way too soft and the cranberries were translucent, after four hours of cooking. HI, I am sorry the veggies where not to your liking. If you like them firmer, try adding them in after 2-3 hours of cooking. That should leave them cooked, but still firm. Let me know if you have questions. Thanks! My husband hates mushrooms and will not eat a meal that one has touched. If I was to make this, what would be a good substitute for one? Or should I just leave it out entirely? Help! I need a nice Gluten free meal for Christmas Eve. Hey Carrie! Just omit the mushrooms from the recipe, no big deal. Hope you love this! Merry Christmas! 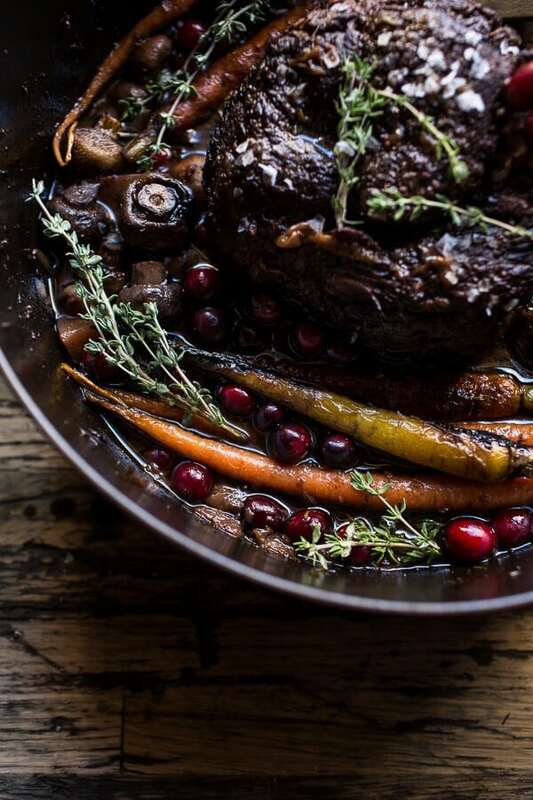 How did you get rid of the grease that the chuck roast will produce? Heartburn is a real thing for me. I will probably drain the whole thing a little before it’s done, put the meat/veggies back in pot while drained fat/broth is chilling, dispose of the solidified fat, and then return broth to pan for last bit of time. 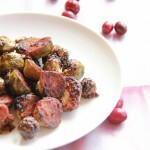 Cranberries are not in season, what can I use in place of or ok to just omit? You can just omit them. Hope you love this! I loooove pot roast. This looks amazing! Quandry…I love potatoes with roast – but the noodles (love them too) look yummy with this, soooo… I will have to make the roast with the potatoes and then the next night (left overs) I will have with noodles. There. Solved that quandry. Sounds like you have the perfect plan to make it your two favorite way!! Hope you love it Reni thank you! >Quandary< I really hate mis-spelling words! When the ingredients say 1 lb chuck roast 4-5, does that actually mean 4-5 lbs of chuck roast? Bc that’s pretty misleading, I already bought 1lb. I wil give this a try as sounds interesting. When I try small red potatoes only, no mashed or pasta. In the pictures I see whole mushrooms, not sliced. I like the whole idea. To have a personal blog is it necessary to have so much “chatting” and so pictures of the same thing different angles? This is a serious question not a criticism. Every blog I go to to check out the interesting recipes seems to follow the same stucture. Hi. Not really sure what you are asking. Potatoes will be great with this as will whole mushrooms. As this is a blog, I can do and say whatever I’d like. I can also post as many photos as I’d like too. It’s a personal blog, so that is all up to the author. This is my FAVORITE pot roast recipe! I love the carrots, onion, and mushrooms combined with the tasted of the cranberry beef. Mashers or noodles are wonderful, but I can’t get over how from scratch baking powder biscuits taste with this amazing combination of decliciousness! Go team biscuits!! Thank you!! Thank you!! I am so happy you loved this Rachel! Hello, I made this dish last night and it was a big hit with my meat-loving husband. I added a few russet potatoes to the other veggies and used only 3/4s of the cranberries. A 4.13 lb chuck took exactly 3 hours to cook to medium well/fork tender. Personally I would add an extra tablespoon of honey next time to sweeten the cranberries a bit, but otherwise this was delicious and so easy to prepare. I have tagged it on Instagram too. I am really happy to hear that you and your husband loved this Nadia! Thank you! Make sure to tag me in the photo, I love seeing what you guys make! Making with meal tonight to serve to my grandparents, pot roast is such a fond memory of my childhood I’m very excited to try this new recipe! Definitely doing mashed potatoes my husband even asked that they be garlic mashed potatoes ! It’s been cooking for 3 1/2 hours and the smell in my house is just fantastic…. I am utilizing your website so often I cannot wait to purchase your cookbook. Ooo I hope you love this roast Shannon! Thank you + I hope you love the book as well! I’ll be making this tomorrow for Nye dinner and I’ll be using a crockpot. Do you think cranberries will turn into mush after 8-10 hrs or will they stay intact? I can’t wait to make this, it’s on the dinner menu for tomorrow! Question – I see in the ingredients list that the carrots and mushrooms are sliced, but in your photos they are not – I like the aesthetic of the whole, un-sliced vegetables better (so pretty, and I love pretty food! ), does it cook the same for whole vs sliced? Hi! Yes, this will cook up just the same if you prefer to not slice your veggies. Please clarify the quantity of carrots. It says “6 inch carrots cut into 1- pieces”. Would that be a certain number of 6-inch carrots, cut into 1-inch pieces? If so, how many carrots? Thank you for the great recipe! Are you able to transfer this to use the slow cooker instead of using the oven? Don’t want to compromise the dish but would rather be able to leave it cooking while I’m at work!! Thanks! A great pot roast recipe! My husband said it was the best one I’ve ever made for him. This was so tender. I couldn’t find cranberries in the store (a little early for Florida), so i mixed in some unsweetened cranberry juice with the wine and a few grapes. Can’t wait to try this again when we have fresh cranberries in the store. Hello! This looks great and I’m wondering if it can be made in an Instant Pot? Any suggestions? This looks amazing! I don’t have a Dutch overn. Could it be prepared in a slow cooker? I made this today and it was delicious! It was flavorful and beautiful! In my oven, it took about 4.5 hours to get it fork tender. Also, next time, I’m going to add the cranberries in maybe halfway into the cooking process to help keep their color and shape better. I will definitely be making this again! Hi Serenity! I am so glad this turned out so well for you! Thank you and I hope you enjoy other recipes on my blog as well! Hi there! First of all, this dish looks incredibly mouth watering! Second, I can’t get fresh cranberries, all we have here are the dried and sweetened ones. Do you think using them will turn out ok? Maybe is should use less honey so it doesn’t get too sweet? This looks so good. If my pot roast is around 2lbs-should I assume it will only take 1.5-2 hours then? I am so happy to hear that! Thank you so so much Aline! Hi there! This looks amazing, going to make it tonight. I could only find frozen cranberrries at the store. Read through all the comments to see if anyone used frozen cranberries, I assume that would work, right? If I let them thaw first? Thank you! Thank you, your recipes are amazing by the way.